Statistical rate theory is a valuable tool to rationalize the microscopic mechanisms of elementary chemical steps in the gas phase, to analyze results of kinetic experiments, and to adequately parameterize the temperature and pressure dependence of rate coefficients. 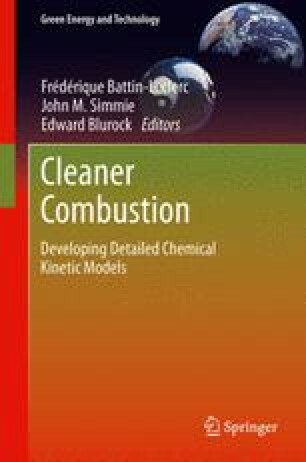 We briefly describe the essential elements of statistical rate theory that are relevant for the kinetic characterization of reactions under combustion conditions, emphasizing application aspects. The calculation of rate coefficients for reactions over potential energy barriers and potential energy wells is elucidated. In the former case conventional transition state theory is used, in the latter case the temperature and pressure dependence is described by means of master equations with specific rate coefficients from RRKM theory and the simplified statistical adiabatic channel model. Examples for the different types of reaction are given, and crucial quantities are discussed. The article primarily aims at readers on an intermediate level between graduate students and junior scientists, who are interested in performing practical calculations, and who are looking for a compact presentation of the topic as a guide to the extensive literature. Financial support by the Deutsche Forschungsgemeinschaft (SFB 606 “Non-Stationary Combustion: Transport Phenomena, Chemical Reactions, Technical Systems”) and by the European Cooperation in Science and Technology (COST, Action CM0901 “Detailed Chemical Kinetic Models for Cleaner Combustion”) is gratefully acknowledged.